Is streaming a viable alternate career path for League of Legends pros? Making a living from League away from the bright lights of the LCS. When it comes to making a living off League of Legends, most people look to the LCS. It’s understandable why this has become the primary way we talk about gamers making money for their skills—the professional stage is flashy, sleek, and professional. Everything about League’s pro scene has seemingly been constructed to compete with traditional sports and stomp on the stereotype that gaming is for nerds. The casters are well spoken and charismatic, the stages are brilliantly constructed, and the entire show has been carefully produced and choreographed to be accessible, entertaining, and something that you could show an elderly family member without feeling embarrassed. With this in mind, it makes sense that when we talk about the financial success of League players we focus entirely on esports. 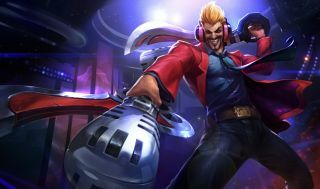 There’s another way to make cash while playing League, however, and it’s becoming a bigger part of the conversation around esports in general. There have been countless headlines lately about the success of Twitch as a platform. Amazon purchased the streaming platform for $970 million, and it boasts over 100 million unique viewers per month. Those viewers tend to stick around, too: half of Twitch users use the site for over 20 hours a week. Watching someone play games has become part of many gamers’ lives. Sure, you don’t want to shell out $60 for Resident Evil 7, but you’ll watch a steamrunner go through it and hang out in chat while he plays. Some people have streams on at work, listening to the soothing tones of Michael “Imaqtpie” Santana, or switch on Zach “Sneaky” Scuderi’s stream while they’re relaxing at night. While there are plenty of games enjoying the limelight on Twitch (Overwatch and Destiny are two other games with massive communities), League is the king. Between partnership, which allows viewers to subscribe to a stream for a $5 fee, ads, and donations, popular streamers can quickly rack up big dollars. The previously mentioned Imaqtpie, who shows up every morning wearing his plain white t-shirt and infectious grin, racks in thousands of dollars off fan donations and subscriptions every month. There are other big names, many of them former or current pros, who pop up on Twitch nearly every night: Sneaky, Bunnyfufuu, Dyrus, Doublelift, and so on. Of course, not every streamer fits into this neat box. Some streamers, Imaqtpie chief among them, have been so successful that they dominate the current conversation around making a career out of League streaming. A recently published ‘guide to streaming’ by Riot highlights two kinds of streamers: personality and educational. This binary is a decent start, but it doesn’t quite encapsulate the weird, wild world of modern day streaming. While pros playing at the highest level bring in donations and acclaim, there are other players making a living while marching to the beat of their own drum. Just look at Kaceytron. Kacey Caviness streams regularly—she’s mostly known in League, although she plays other games—under the “Kaceytron” persona. She plays League at the Bronze level, although she often brags facetiously that she’s meant to be Challenger. Kaceytron is a dark mirror of girl gamers, or at least the public perception of what a fake gamer girl is. You’re not watching for the gameplay (unless you’re really into seeing whiffed Syndra combos), you’re watching for the bizarre satire and deadpan. Sometimes, a personality can go too far. Polygon wrote a fascinating piece on the infamous Tyler1, and how his over the top toxic nature has made him public enemy #1 in the eyes of Riot. Tyler still streams, and collects a huge audience. The more over the top toxicity he displayed, the more fans ate it up. So why does offbeat personalities and approaches succeeding on Twitch matter? Well, streaming for a living is becoming a more popular avenue. We discussed the bright light of the LCS stages earlier, but the fact is, only ten teams with five players each can compete. (Okay, some teams have experimented with six to ten man rosters, but the point is that it’s a finite pool). The Challenger circuit may allow for a few more spots, but if you want to make a living off playing League for a living, you’re fighting with thousands of others of talented players. Not only are up and comers smart to consider moving into streaming as an alternative to pro play, but pro players are dropping out of the LCS to stream. TSM Doublelift is one of the most notable cases from recent memory. After a successful summer split with TSM, and then a less successful run at Worlds, Doublelift stepped down from the most successful North American team to build a content brand. He’s following in the footsteps of Dyrus and TheOddOne on TSM, and they’re not alone. The LCS schedule can be grueling. Scrimming, practicing, gym time, playing... It all adds up. If you want to aim for the top, you have to deal with the inevitable psychological fallout when you don’t eventually get there. Meanwhile, watch Imaqtpie for a few hours. There are no shots of him sobbing at his keyboard, no long interviews, and so on. This isn’t to say that these things are bad, but they are part of the package of pro life, and some players want to opt out. The problem is that streaming life is going to quickly become saturated as the years go by. Not everyone can be a big name streamer—or even a B tier. The truth is, part of streaming success is a gamble. Do you play an interesting role? Are you competing with a big name in a time slot? Even former LCS pros have failed to make an impact on Twitch, while Kaceytron continues to make a living off her surrealist look at one girl’s gamer life. As Twitch becomes more of a viable career path, we’ll likely see pros trying hard to forge their own unique, memorable brand.